As a kid I was a big reader, so much so that it affected the teenage me in a strange way. I shambled my way through day to day life with an inner monologue consisting of a poorly written commentary of whatever was happening on the outside. It made me awkward around people and perhaps slightly weird to their eyes. Inside my head the Adrian Mole-esque account of my life gave me a hint of misplaced superiority. All this carried on pretty much until I discovered girls and then I went properly crazy. I dropped the books and became infatuated with a series of young women with prominent breasts. Most of whom fell for my foppish blond curtained hair, my small selection of local punk band t-shirts and my own brand of dour intellectualism with a hint of melancholy. How could they resist! One of these woman was herself an avid reader and she bought me back in from the cold as she chucked her books in my direction when she’d finished reading them. She introduced me to things like Iain Banks’ Complicity, Nick Hornby’s High Fidelity, Irvine Welsh’s Trainspotting and, my subject matter today, Sebastian Faulk’s Birdsong. I nearly didn’t make it through the first few pages if I’m honest. It’s written in a classical style that didn’t appeal to my young brain but soon the Great War stuff kicked in and I was hooked. The first thing to point out is that it isn’t really a film at all but a two part miniseries adaptation. It was made by the BBC and Working Title Pictures and stars Eddie Redmayne as the protagonist Stephen Wraysford. I struggle a bit with Eddie Redmayne if I’m honest. He seems to have one technique for acting which involves making the most expressionless face possible and then talking without moving his lips. The characters I know and love from the book are all here. There’s his love interest, the coy and fragile Isabelle, her husband Azaire, his daughter Lisette and Son Gregoire. We meet the tunneller Firebrace and his team along with the other sundry characters from the trenches who somehow seem to pretty much all survive through to the wars end along with him. 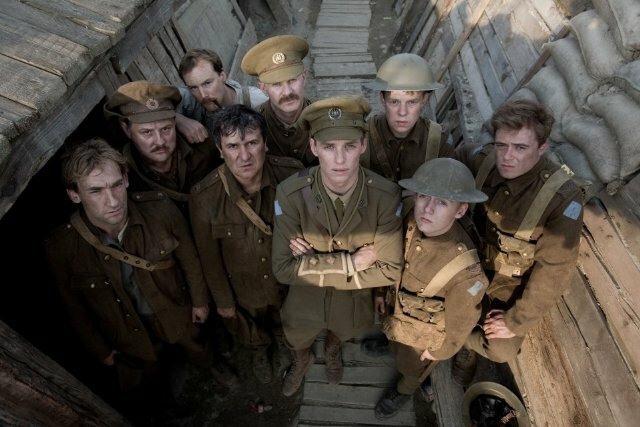 There’s also Private Peaceful star George MacKay in his second Great War Film of 2012, fresh from starring alongside Richard Griffiths and Frances De La Tour in the eponymously named ‘Private Peaceful’. He lasts all of two minutes before copping a near direct shell hit, having his intestines spilled on the dirt and dying as Stephen gets him to reminisce about his girlfriend. I think they’ve adapted well from the source material. As anyone who has read the book knows there are three timelines to deal with. There’s the 1910ish bits, with the Stephen/Isabelle love story, the war years and then the early 1970’s where the Granddaughter of Stephen and Isabelle finds her Grandfathers diaries. This would’ve been a lot to deal with for a film so they’ve made the common sense move of treating the war years as the main story with flashbacks to the love story and completely ignored the 1970’s stuff. 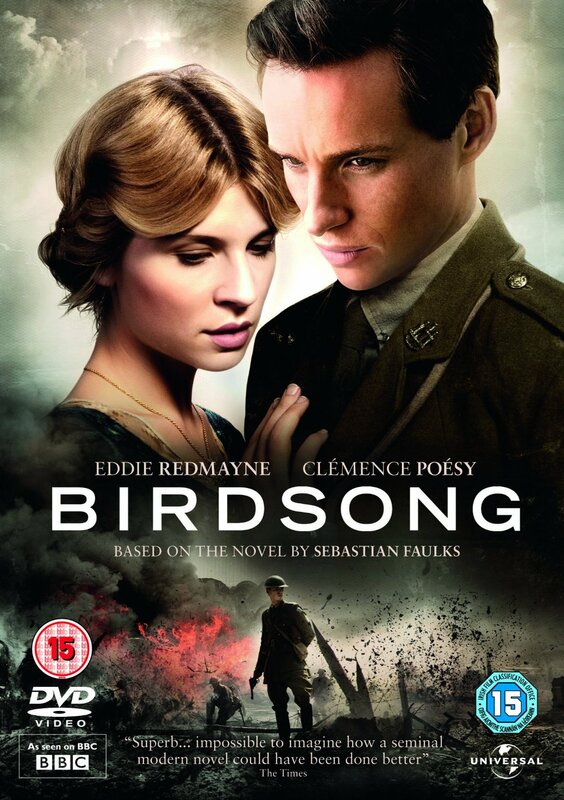 In practice this makes the story work better on film but also makes it very similar to some other recent Great War Films such as ‘Forbidden Ground’, ‘Beneath Hill 60’ and maybe even ‘The Water Diviner’ (oddly all Australian films). With this being a BBC production, the quality is through the roof. It makes one proud to be British. The locations work really well, the CGI does look a little obvious and therefore cheap but this is TV and the BBC has to spend the licence fee sparingly. I’m sure if this was a full, balls out feature film (and there is apparently one on the way!) then no expense would be spared and all bells and whistles would be utilised. Redmayne is good even though I don’t like him. His paralysed gurnface was on show throughout but I managed to ignore it for the most part. The war stuff is well knocked out although, in places, slightly generic. We have some of the staple events that I’ve come to recognise in every single trench film. The friendship between two Officers bunking together but with otherwise nothing in common, the usual class and rank struggles where officers are begrudgingly respected by their men but offer little care in return. There’s the stock standard ‘head above the parapet getting instantly shot off by a sniper’ scene that they all do and the ‘completely random shell bust in a comparatively safe area’ bit as well (Au Revoir, Private Peaceful!). There is an advance/attack that is shot slightly differently to the other films I’ve seen, I think mainly due to the advent of CGI. We see a wide expanse of no mans’ land filled with a few hundred men. Slowly they drop as shells and raking machine-gun fire hit their targets. Pulled out this far it’s possible to view the battlefield through the eyes of the Generals on distant hills and view, with a fomenting horror, the true disaster unfolding. 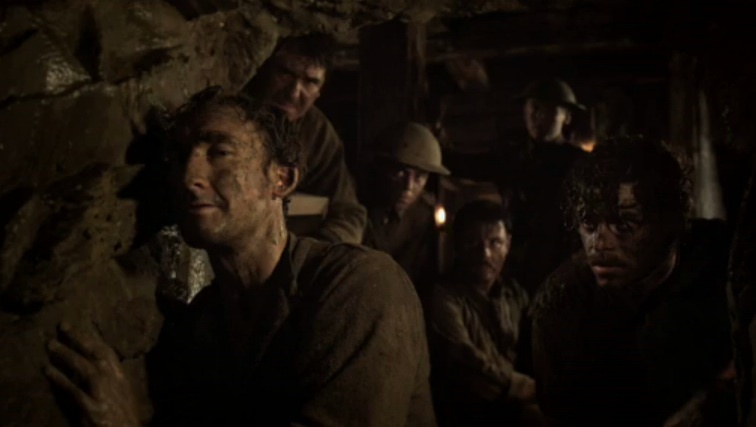 The tunnel scenes are not as well put together or as claustrophobic as ‘Beneath Hill 60’ but that’s okay. The whole point of ‘Beneath Hill 60’ was the tunnelling whereas it’s just a part of the overall story here. The flash backs to the love story are where the emotions are really laid bare. The early lust between Stephen and Isabelle is palpable (as it is in the book) and the visual world I conjured in my head upon my initial reading of the book appears to be pretty faithful to the world on screen. In all honesty I am struggling to find much of fault. Which leads me onto my conclusion. This is a story I hold near to my heart and a part of me was slightly panicky before my first viewing as I wanted it to live up to my expectations. Luckily, it did. The adaptation from the book is really well written, visualised and acted. The omissions make sense and the motives of the characters have remained true to the original. I’m also glad that this a very rare thing for me. It’s a Great War Film that the Mrs will like. So do, if you haven’t already, find it and watch it. But, as I sometimes say in these things, maybe read the book first for the full effect. Clicky Clicky to get either the book, the DVD, or maybe even both.